Sunshine and a few afternoon clouds. High around 60F. Winds WSW at 5 to 10 mph.. Partly cloudy skies this evening will become overcast overnight. Low 36F. Winds WSW at 5 to 10 mph. Three members of the Fish and Wildlife Commission have been nominated for reappointment, including Shane Colton, Logan Brower and Tim Aldrich. Pat Byorth has been proposed to replace outgoing commission chairman Dan Vermillion. 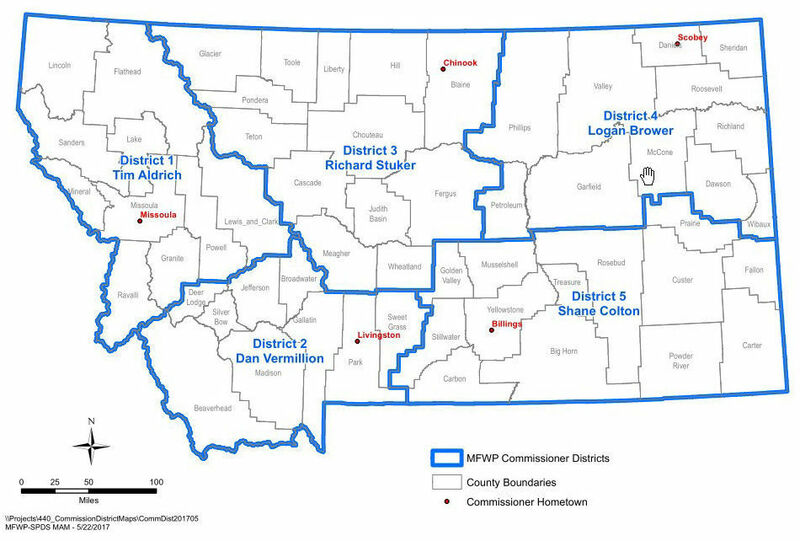 This map shows the districts covered by the five Montana Fish and Wildlife Commission members. Sportsmen-landowner relations and elk hunting regulations were just two of the topics that four Fish and Wildlife Commission nominees addressed during a confirmation hearing on Thursday in the Senate Fish and Game Committee. All picked by Gov. Steve Bullock, three of the five-member panel that oversees Fish, Wildlife and Parks are seeking reappointment, including: Tim Aldrich, of Missoula; Shane Colton, of Billings; and Logan Brower, a Scobey school teacher. Pat Byorth, of Bozeman, is the only new nominee. He has been chosen to replace Dan Vermillion to represent southwest Montana. The term of current Commissioner Richard Stuker, of Chinook, extends for another two years. If approved, Aldrich and Colton would serve until 2021. Brower’s and Byorth’s appointments would extend until 2023. Sen. Doug Kary, R-Billings, took the hearing as an opportunity to stress his displeasure with FWP’s handling of elk hunting regulations in the Missouri Breaks. “Why limit opportunity when elk are over objective and have been for a number of years?” he queried. Kary also said the agency has not followed its 2004 elk management plan, yet is seeking to write a new one. Although not specifically opposing Colton, Kary asked him to “fix” the Missouri Breaks elk regulations and to work with landowners. Colton had served on the commission from 2005-13 before being reappointed when Matt Tourtlotte’s nomination was rejected two years ago. During his first tenure Colton said the determination to put the Missouri Breaks on restricted archery permits was made after 60 public meetings to try to make the hunt fair for rifle hunters. The new regs have increased the archery harvest by 30 percent, he said. “The feedback from sportsmen since then has been very positive,” Colton added. A Billings attorney, Colton was also questioned about his dealings with landowners and whether he could represent their interests, which at times collide with hunters when it comes to access to public wildlife. Growing up farming and ranching in Denton, Colton said his background gave him insight to the struggles of landowners. “I’m in support of anything that improves access that a landowner wants to give,” he said. Such cooperation takes time and requires FWP to build trust with landowners, which isn’t easy when large ranches are owned by out-of-staters who may not share the same concerns as locals, he noted. Missoula native Tim Aldrich, who worked as a wildlife biologist for the Forest Service, pointed out that “in hunting … the trail goes through the landowner,” meaning that they must be a full partner with FWP, sportsmen and women. Yet he also said that it’s important to have regulations that work for landowners that may make some public wildlife advocates uncomfortable. Byorth drew the most scrutiny and opposition because of his work with Montana Trout Unlimited. A former fisheries biologist for FWP for 17 years who grew up in Billings, Byorth also has a law degree he uses to work on instream flow issues for the conservation group, mainly in an administrative role. “He has strong ties to a special interest group rather than all Montanans,” said Dale Gilbert, an Ulm-based walleye advocate. Byorth said if there’s a concern about his background conflicting with an issue that comes before the commission he would recuse himself. Sen. Jennifer Fielder, R-Thompson Falls, sponsored the nominations as required by her role as Senate Fish and Game Committee chairman. Although not testifying for or against the men, she said she hoped they would listen to Montana citizens and not further restrict trapping in Montana, support trapper education and the right to trap, hunt and fish in the state. Fielder said action on the nominees could be taken as early as Tuesday and no later than Thursday. She encouraged anyone with concerns about the commission candidates to contact her or other members of the committee. Final approval of the nominees goes to the full Senate. The proposals are contained in Senate Resolutions 28 and 48. Nearly 20 percent of resident hunters and more than 27 percent of anglers in Montana are female, but it has been more than 15 years since a woman served on the oversight board for Montana Fish, Wildlife & Parks. The Relay for Life event is making the fight against cancer fun. Be sure to check out this special publication for the event, going on July 30 in Butte.